Citizens First Bank welcomes Shauna Bellich to their staff, as Vice President of Information Technology and Operations. Shauna brings over 14 years of experience in banking, including lending, operations, information technology, human resources, and finance. 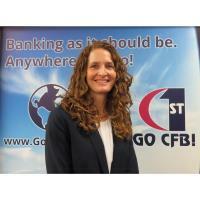 Most recently, she was employed at the Savanna – Thomson State Bank as Chief Operations Officer. Shauna holds a Bachelor of Science degree in Computer Science from the University of Wisconsin – Platteville, with a minor in Business Administration. Currently, she attends Western Illinois University, where she is studying for her Master’s degree in Business Administration. Shauna resides in Thomson, IL with her husband and two children. She enjoys spending time with her family and friends, and also enjoys shopping, sports and photography.